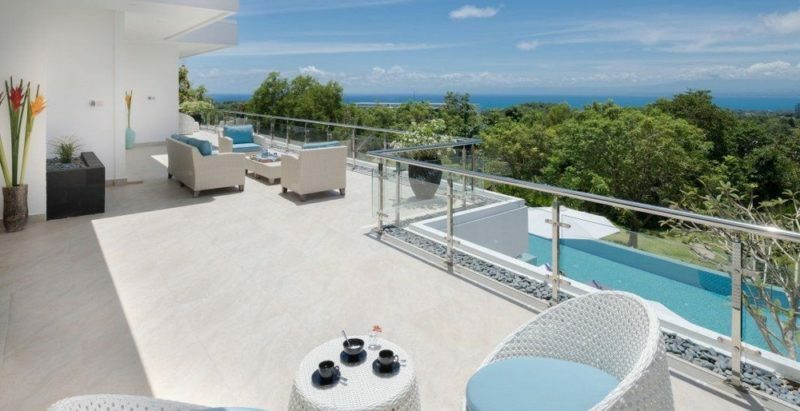 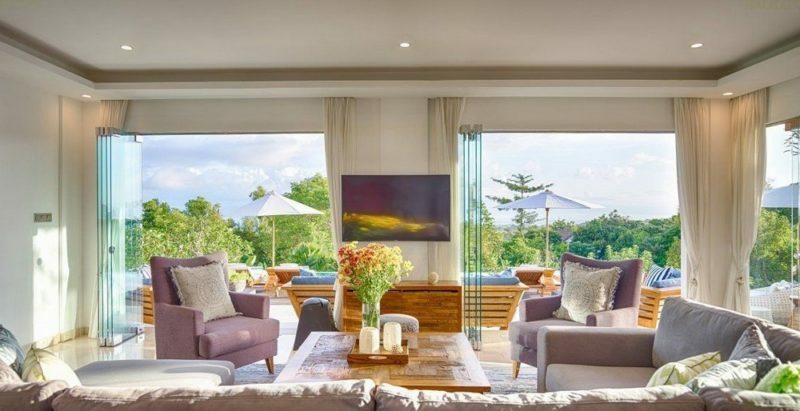 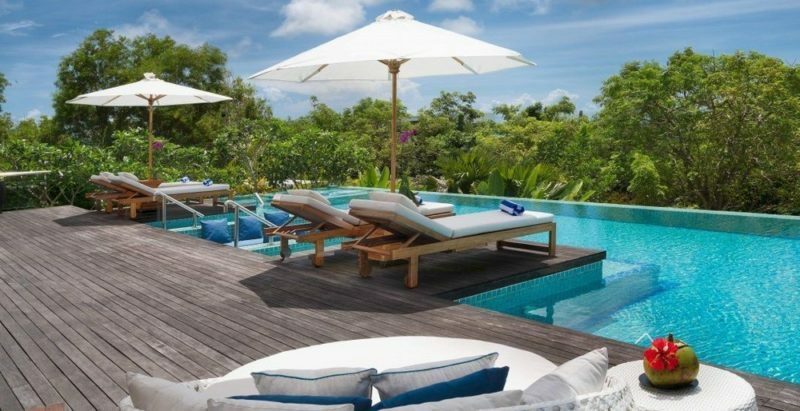 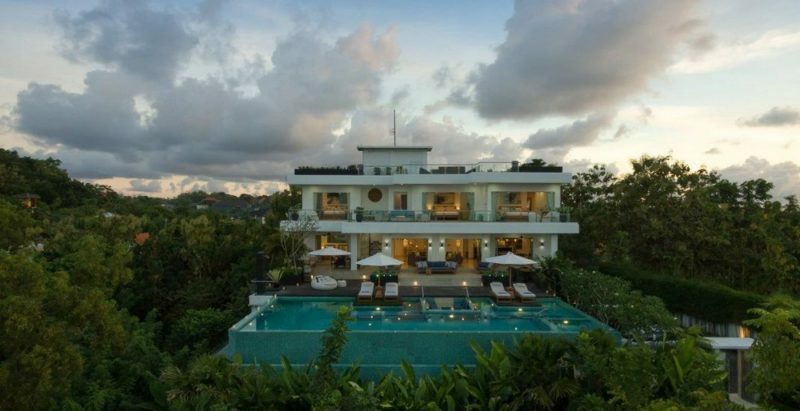 Villa Kalibali is a splendid fully staffed, 4-bedroom holiday villa tucked into the contours of a scenic hillside in the village of Pecatu on Bali’s Bukit Peninsula. Set in a spacious garden Villa KaliBali is blessed with spectacular panoramic ocean views, spanning much of Bali’s west coast in Jimbaran. 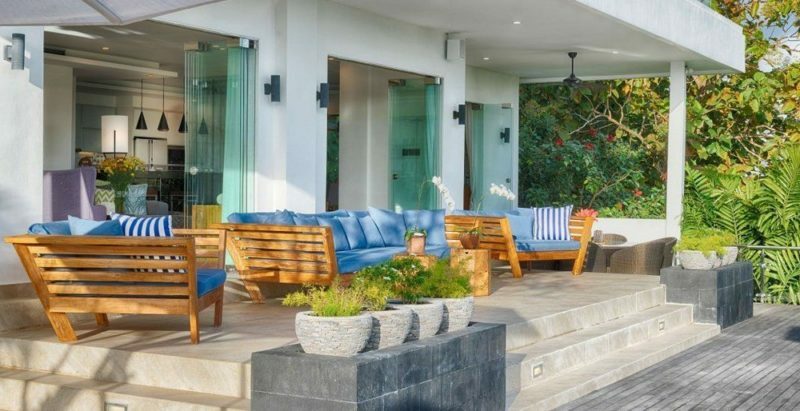 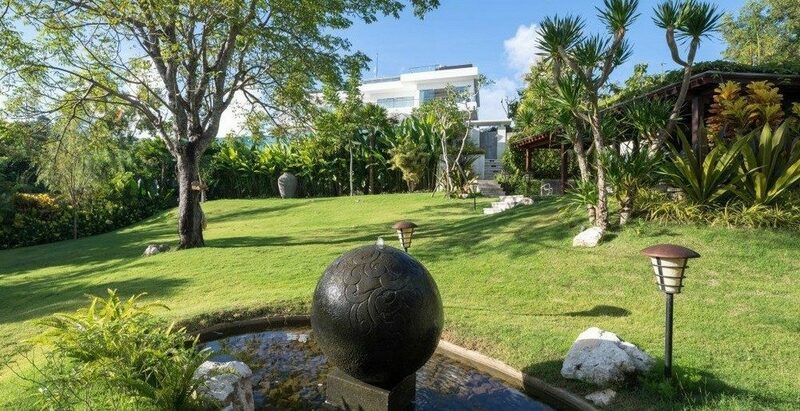 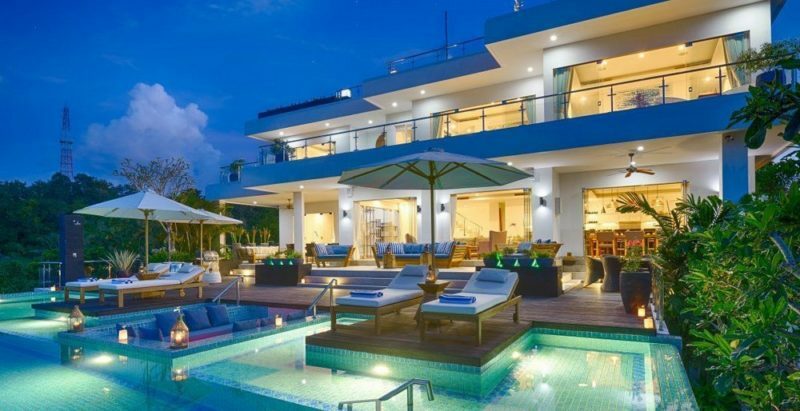 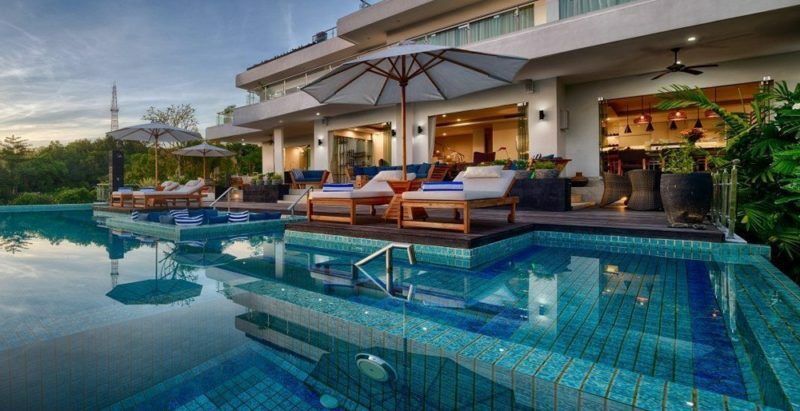 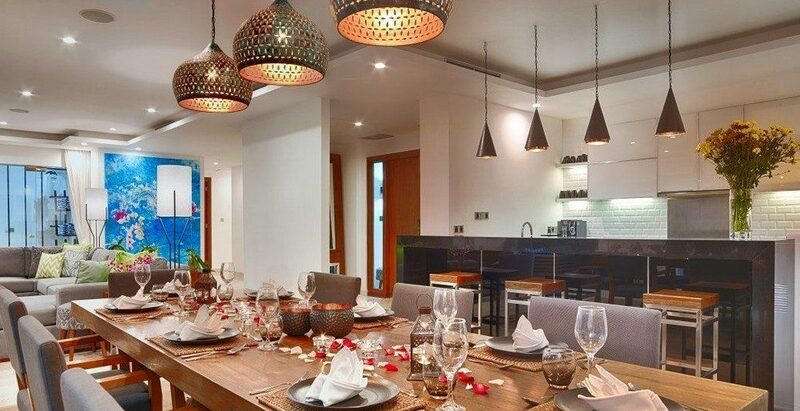 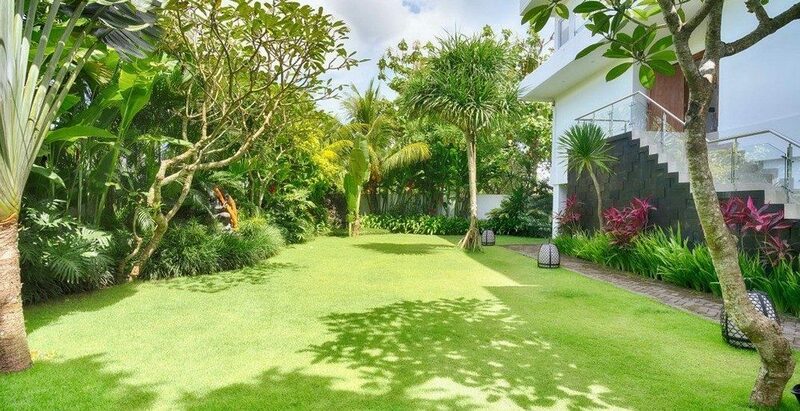 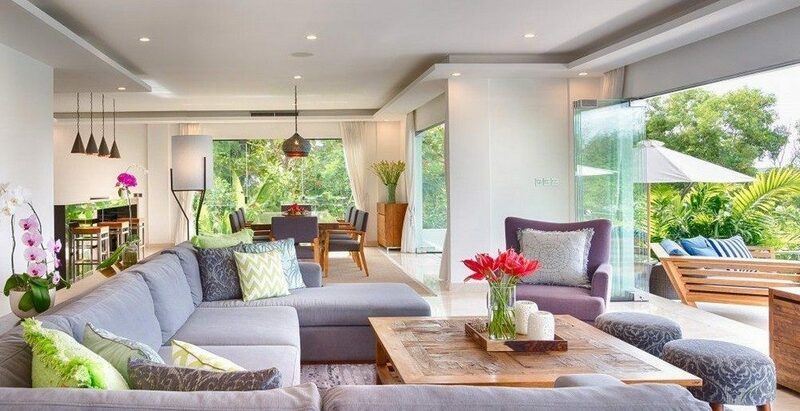 Guests who stay at this luxurious destination villa in Bali will have no need to leave the environs. 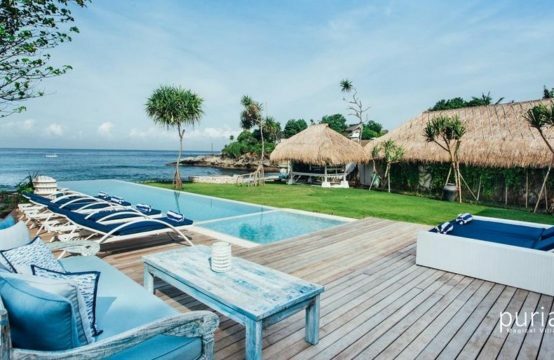 Nevertheless, the Bukit Peninsula is surrounded by idyllic golden-sand beaches and the island’s best surf breaks, complete with cafes, fine-dining Bali hotel restaurants, and stylish Bali beac. 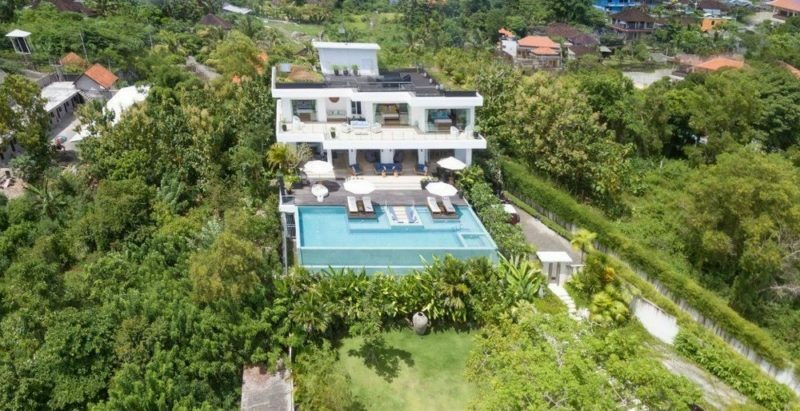 Each of Villa KaliBali’s four air-conditioned bedrooms is fitted with a teakwood floor and equipped with wardrobes and a safe deposit box; each is adjoined by a private bathroom. 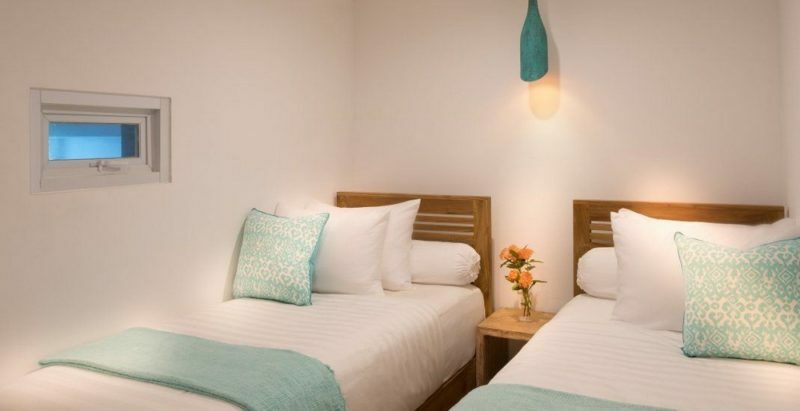 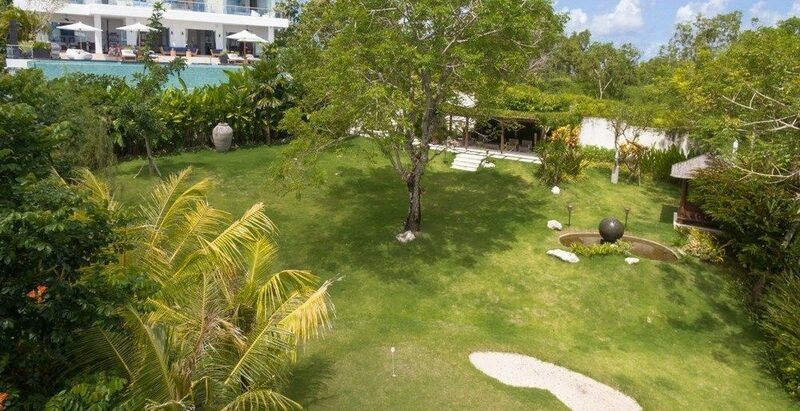 One bedroom is located on the ground floor, with sliding doors that open to the pool deck; it is furnished with twin beds, which convert to a queen-size bed if required, and the bathroom fitted with a walk-in rainshower. 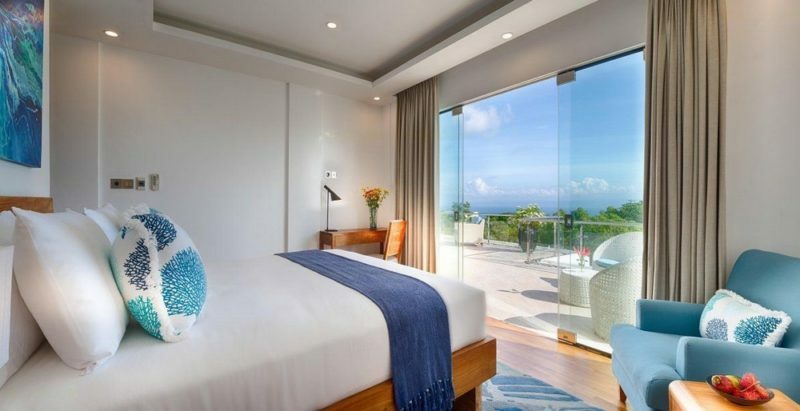 The large master suite is positioned on the upper floor and is furnished with a queen bed; its integrated bathroom is fitted with a walk-in rainshower and a bathtub. 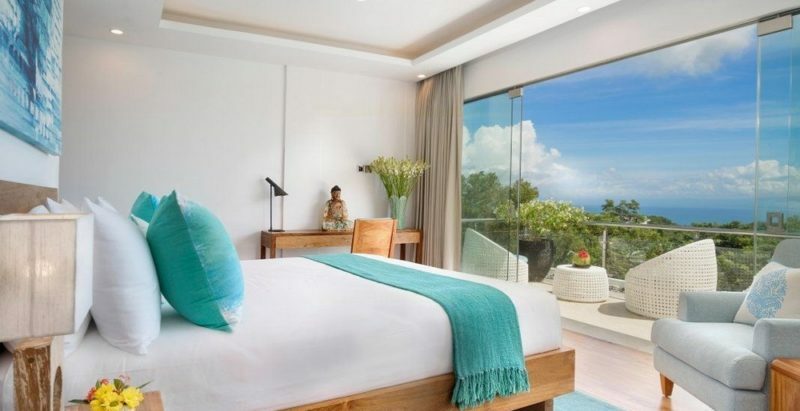 Two more guest bedrooms are also situated on the upper floor, and each is furnished with a queen bed. 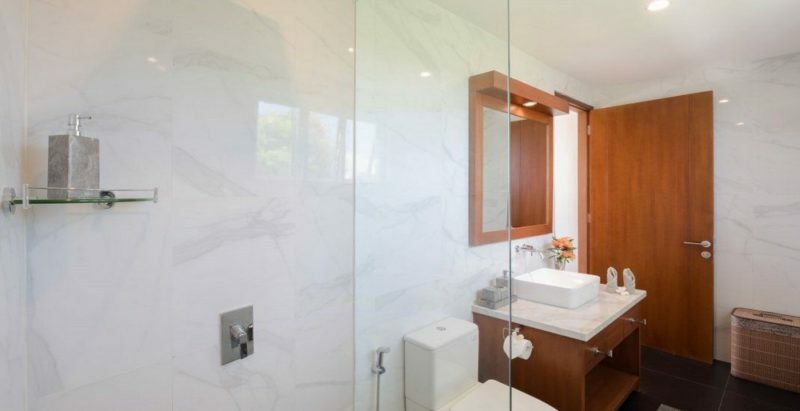 Both of the ensuites are fitted with a walk-in rainshowers, and one of these bathrooms has the additional luxury of a bathtub. 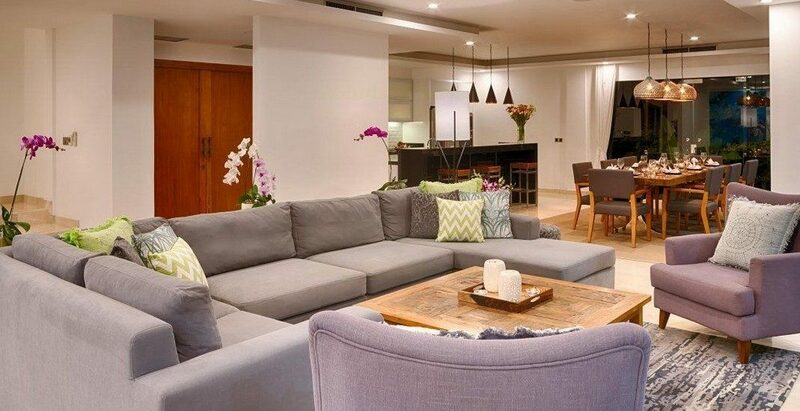 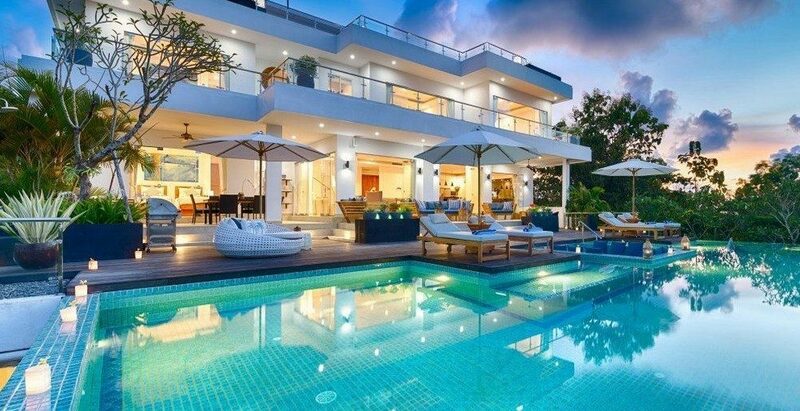 These three bedrooms all have glass doors opening to a broad balcony-deck. 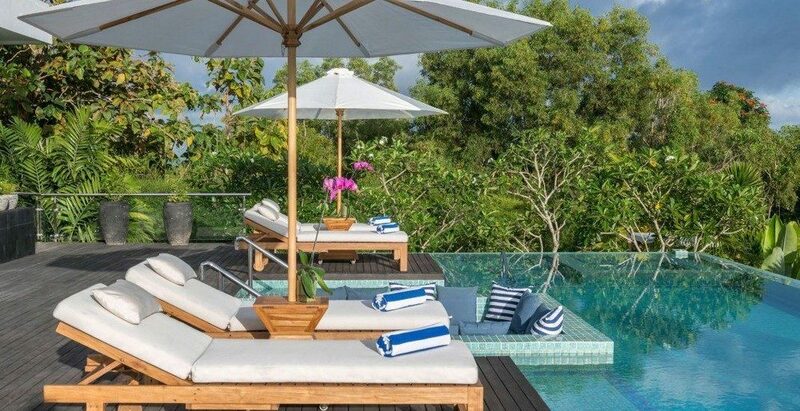 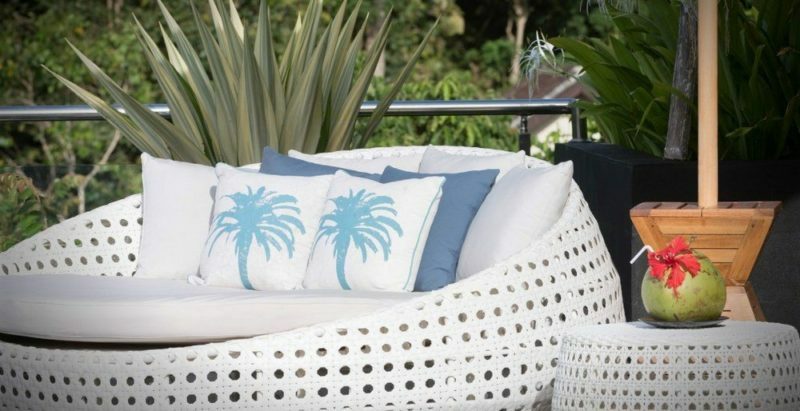 The walled garden presents a fabulous 16×7-metre swimming pool incorporating a Jacuzzi, and bordered by a wide timber deck furnished with sunloungers. 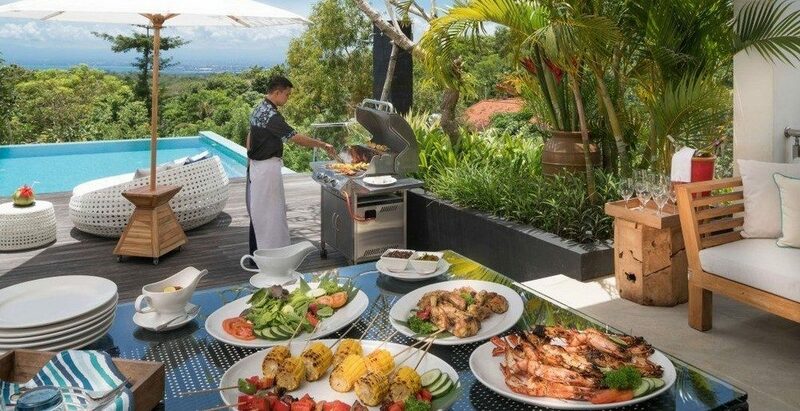 Also poolside is a sheltered fan-cooled terrace with an alfresco dining table for six, a sofa and a gas barbeque. 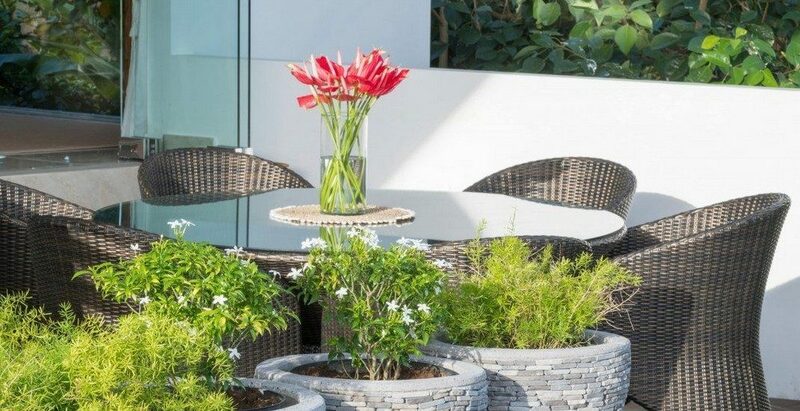 The walled garden features lawns, mature trees and flowering shrubs. 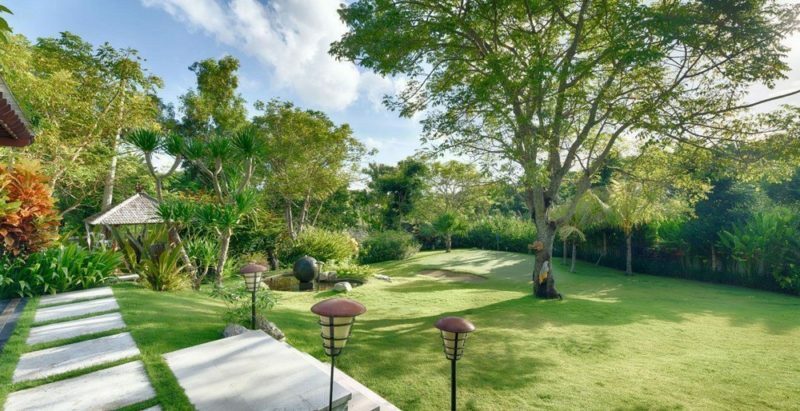 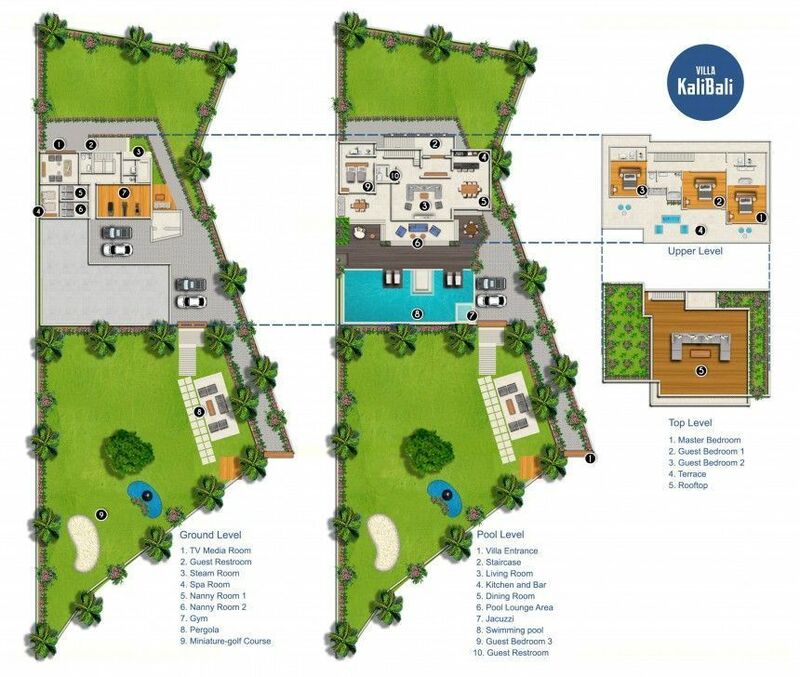 A separate garden area, complete with a wooden pergola, has a private miniature golf course, which is a great way to bring together friends or family members of all ages. It is also the perfect venue for a Bali wedding. 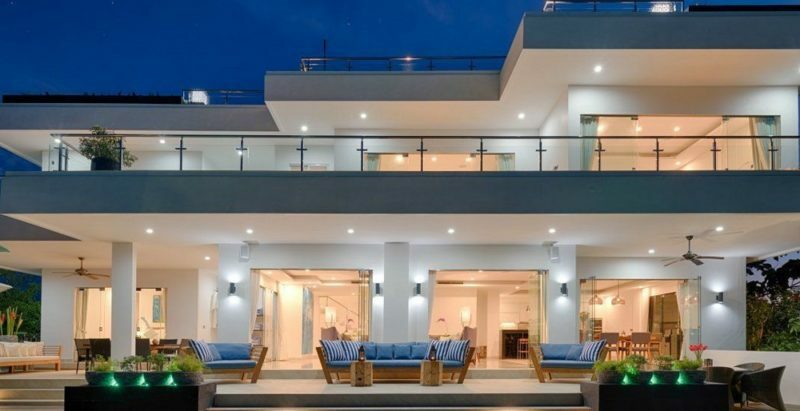 A staircase leads up to an expansive rooftop entertainment terrace, offering fantastic views. 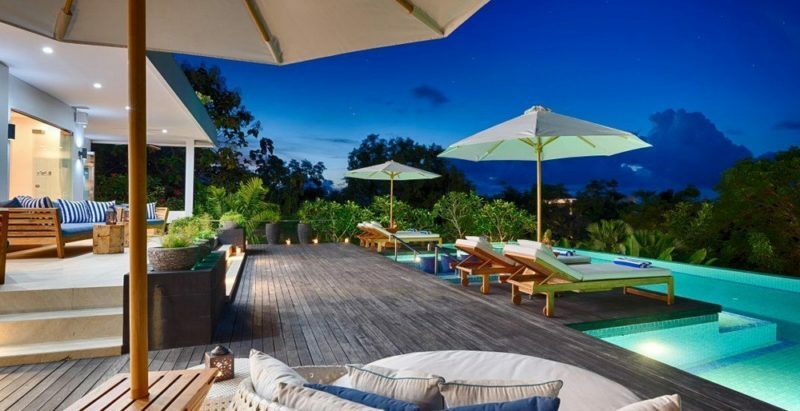 Featuring a timber deck, dotted with potted plants and furnished with all-weather sofas and chairs, this breezy space is ideal for enjoying the sunset or hosting evening parties. It’s like being on the top of the world! 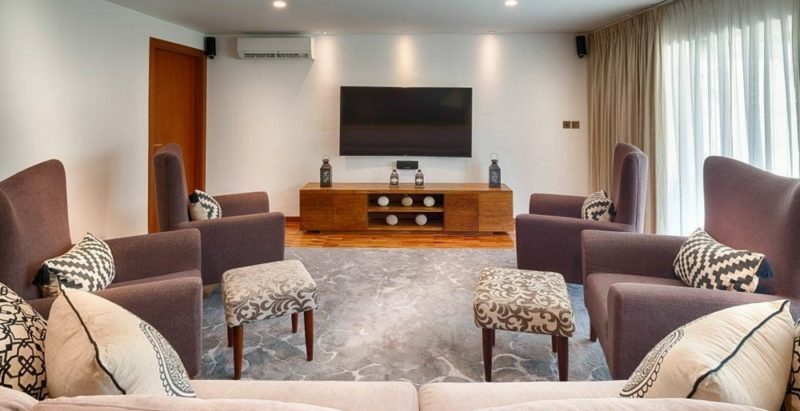 On the lower ground level is a cosy air-conditioned TV room, characterised by a parquet floor and a textured palimanan stone wall, furnished with a large sofa, and equipped with a 65-inch smart TV. This is the place where everyone can congregate to watch movies on the ultra-wide curved screen. 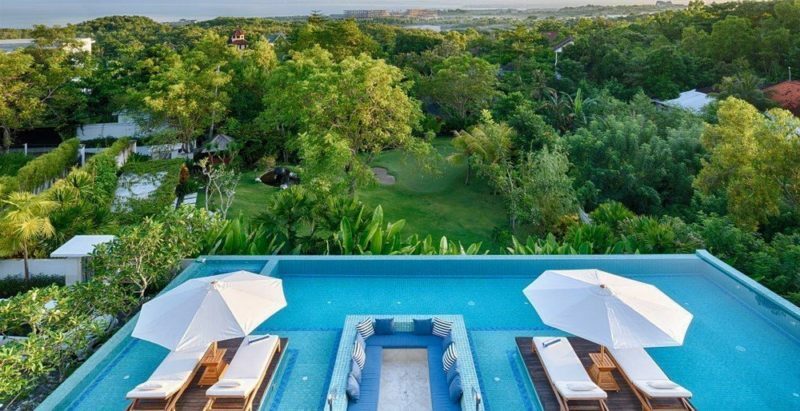 Also on this level is a steam room crafted in marble, with an adjoining shower room, and an air-conditioned spa room with two massage beds. 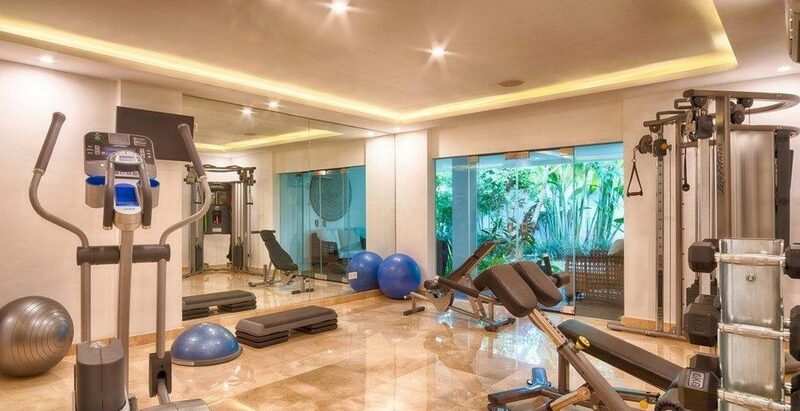 Next to this is a private air-conditioned gym, equipped with a Life Fitness Home Gym with bench, a cross trainer, weights, mats and gym balls. 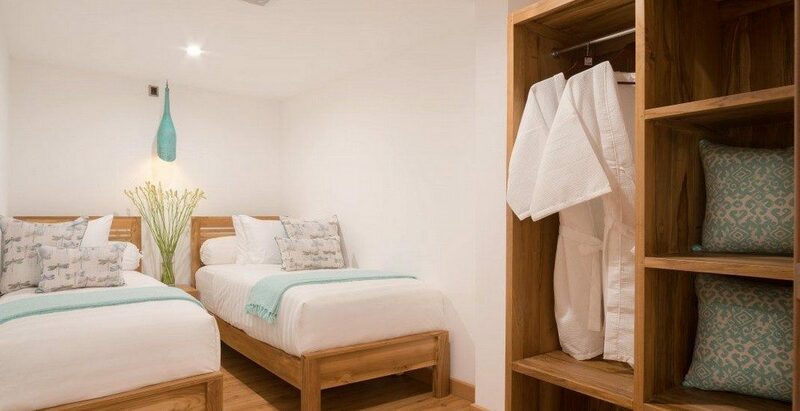 This floor also features a thoughtful inclusion for guests who travel with helpers or nannies – two small bedrooms, each furnished with a pair of twin beds, and supported by a shared bathroom.